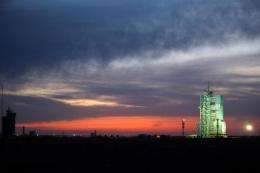 China's unmanned spacecraft Shenzhou VII sits on the launch pad at the Jiuquan Satellite Launch Centre in the northwestern province of Gansu in October 2011. The Shenzhou VIII returned to Earth on Thursday, state media reported, after completing two space dockings that have pushed forward the nation's ambitious space programme. China's unmanned spacecraft Shenzhou VIII returned to Earth on Thursday, state media reported, after completing two space dockings that have pushed forward the nation's ambitious space programme. The vessel's re-entry module landed in the northern region of Inner Mongolia after it separated from its orbital and propelling modules just before entering Earth's atmosphere, the official Xinhua news agency said. Shenzhou VIII, which means "divine vessel" in Chinese, took off from northwest China on November 1, and docked with the Tiangong-1 experimental module twice in the nation's first ever "kiss" in space. The successful manoeuvre is key to China's ambition to set up a manned space station by 2020 -- a goal that requires it to perfect docking technology. The technique is hard to master because the two vessels, placed in the same orbit and revolving around the Earth at thousands of kilometres per hour, must come together very gently to avoid destroying each other. China is expected to launch two more spacecraft next year to dock with Tiangong-1 -- the Shenzhou IX and Shenzhou X -- at least one of which will carry astronauts on board. May your space sciences avoid political influence.